No offense, but no one goes to IGN.com for quality journalism. The gaming monolith's many sites are popular because they post lots of news and update often. You could have called me pleasantly surprised, then, when I came upon one of yesterday's featured articles, Videogame U. 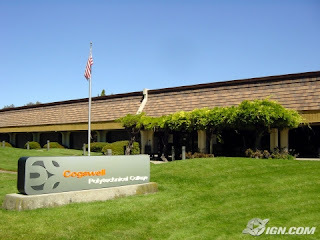 Writer Jonathan Miller displays some great reporting and writing in this article about Sunnyvale, Calif.-based Cogswell College, one of the growing number of schools offering courses game design. Full disclosure: I seriously considered applying at DigiPen when it first opened its doors many years ago. I probably could have gotten in too, but I just couldn't bear to leave my family and friends at the time. I don't really regret that decision, but I sure do envy those who get to make a living in the gaming industry.